Posted on September 1, 2017 by thelostlighthouse	in Podcast and tagged Ancillary Mercy, Ann Leckie, Apocalypse World, books, daredevil, Dark Imperium, Emma Cline, Imperial Radch, Iron Fist, Jessica Jones, Luke Cage, Marvel, Marvel Netflix, Netflix, Sci-Fi, The Defenders, The Girls, The Lost Lighthouse, The Mist, TLL, tllpodcast, Uncharted, Uncharted The Lost Legacy, Veep, video games, Weekly Rapture. This week Gary guest starred as Ian was due his watch at the wall. Adam didn’t have time to sort news out though! We review The Defenders, the latest Marvel Netflix series that sees Daredevil, Jessica Jones, Luke Cage and Iron Fist team up finally. We go into spoilers from 23:25-37:55! Posted on August 10, 2017 by thelostlighthouse	in Comics, Literature and tagged Brian Michael Bendis, comics, comics reviews, Danny Rand, daredevil, David Marquez, Iron Fist, Jessica Jones, Justin Ponsor, Literature, Luke Cage, Marvel, Marvel comics, Matt Murdock, Netflix, superhero, superhero comics, The Defenders, TLL, VC's Cory Petit. This week will be a bit of a short review (its late! 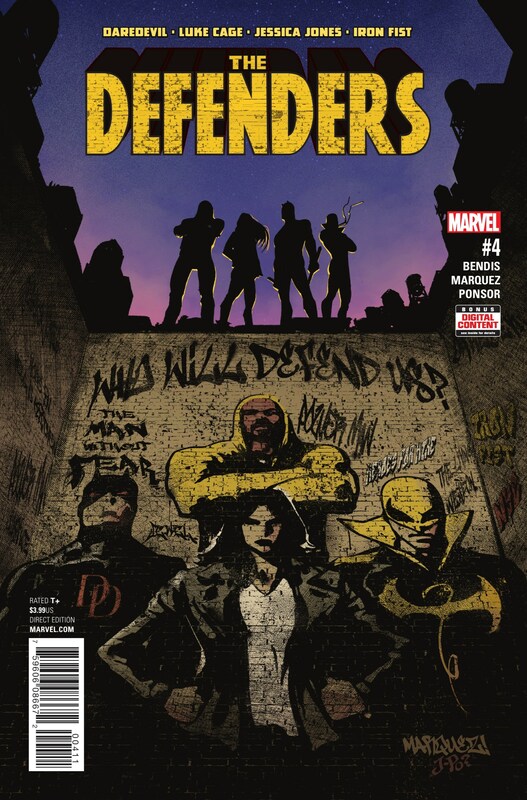 ), but I picked up The Defenders #4 from Marvel Comics, written by Brian Michael Bendis and drawn by David Marquez, with colours from Justin Ponsor and letters from VC’s Cory Petit. This iteration of The Defenders stars Luke Cage, Jessica Jones, Iron Fist and Daredevil (hey, isn’t there a TV show coming soon with this exact team? ), as they face off against a back-from-the-dead Diamondback, who is not only pushing a new deadly drug onto the streets, but also seems to have equally deadly superpowers of his own. 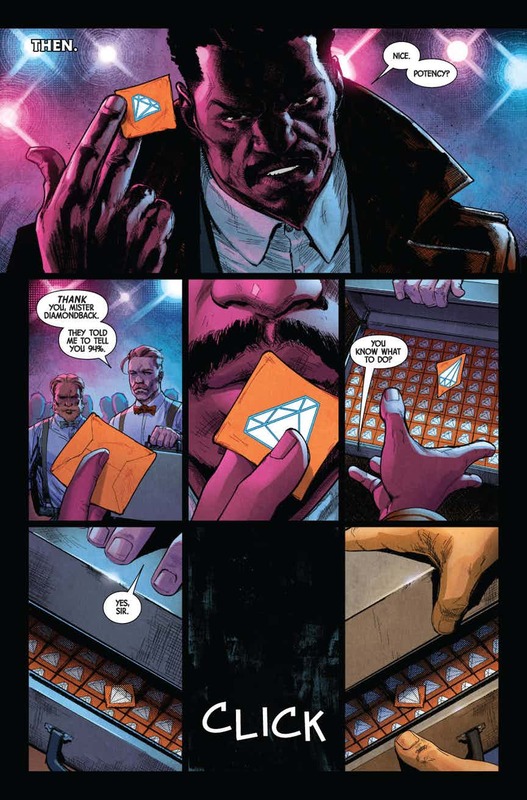 He has already beaten Cage, and at the close of issue #3 it looked like he had put Iron First down permanently. But now that members of this newly formed Defenders team have started to work together a little more, Diamondback may have bitten off a little more than he can chew with these heroes. It is interesting to see how much The Defenders has been informed by the Netflix shows, or at least what has been well regarded about them. Most of the characters are consistent between the comic and TV show versions (Diamondback not so much). However, Danny Rand is much more in line with the comic book version of the character, and the series is better for it. But there does seem to be a leaning on recognizable elements, and the next threat the team will face looks to be no different. However, with issue #4 wrapping up the initial conflict with Diamondback, this has been a very kinetic, simple and fun story. However, as with Civil War II last year, the real headline for this book is David Marquez’s art. Everything in these 4 issues has been consistently great, with superb character work and even stronger action. The start of the issue is quick but subdued, with some very good shadow effects in the club and facial work from both the couple partaking in the Diamond drug, and the journalists at The Bugle. But the 3 pages with Iron Fist unleashing his full power on Diamondback was gorgeous work from Marquez, and Ponsor’s use of dazzling yellow fire and red strikes made those pages sing. The Defenders #4 is a fun cap to a very enjoyable opening arc. Bendis knows how to write team books and he knows how to write these characters. But David Marquez turns this into a truly strong book, and well worth picking up. Check it out digitally or in our local comic book shop now! Posted on May 12, 2017 by thelostlighthouse	in Podcast and tagged American Gods, Baby Groot, David Keenan, films, GOTG2, Guardians of the Galaxy, Guardians of the Galaxy Vol. 2, Horizon Zero Dawn, movies, On Writing, Pokémon Red, PS4, Sci-Fi, Stephen King, The Dark Tower, The Defenders, The Lost Lighthouse, This is Memorial Device, TLL, tllpodcast, video games, Weekly Rapture. This week we chat about the trailers for The Defenders and The Dark Tower (we recorded really early on in the week, before the Blade Runner 2049 trailer came out). This week we were joined by Rose and the three of us chatted about the new Marvel film and sequel to the surprise hit of 2014. We go into spoilers, so if you haven’t seen it yet skip 29:58-47:20! Posted on October 14, 2016 by thelostlighthouse	in Podcast and tagged Annihilation, Bioshock 2, Black Mirror, gaming, Iron Fist, Jeff VanderMeer, John Wick 2, Logan, Luke Cage, Marvel, Marvel Netflix, Morrowind, Neil Gaiman, Netflix, Neverwhere, podcast, Power Rangers, PS4, Sci-Fi, The Defenders, The Lost Lighthouse, TLL, tllpodcast, Weekly Rapture, Westworld. This week we chatted about the Iron Fist trailer and the announcement of who is playing the villain in The Defenders, and the trailers for Power Rangers, Black Mirror Season 3 and John Wick 2. We thought almost all of those looked awesome. We also chat about Logan, and a few of the games that came out over the last few weeks. We checked out the latest offering from Marvel and Netflix, with special guest Rose Christopher joining us to chat about Power Man’s first series. We chat about what we thought worked and what didn’t. We do go full spoilers, so if you haven’t seen it yet skip from 30:00-50:18.